Totally agree with this guy. Anyone that dares to claim that this song is more offensive than the Pope’s actions are morally bankrupt. 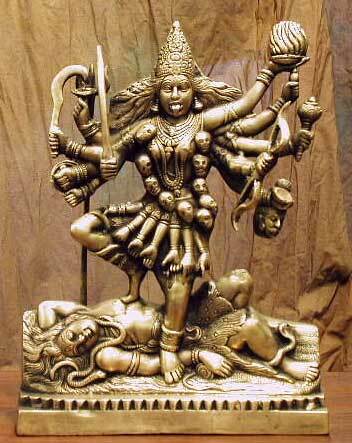 Kali is a Hindu goddess that is often depicted with a necklace of skulls dancing on the body of her unconscious husband, Shiva. forehead. Her body is naked save for a girdle of giants’ hands suspended from her waist; round her neck she wears a long necklace of giants’ skulls: like the Egyptian Isis, Kali can conceal herself in her long and abundant hair. She has four arms: in one she holds a weapon, and in another the dripping head of a giant; two empty hands are raised to bless her worshippers. Like the Egyptian Hathor or Sekhet, the “Eye of Ra”, she goes forth to slay the enemies of the gods, rejoicing in slaughter. The Christian Passion is not the first sacrifice to have been portrayed as the means to salvation. Many cultures since before history have used sacrifice, human, animal, and agricultural, as offerings to the powers that be. These, less theological, but just as mystical acts of devotion are often seen as representative of hubris, an anthropomorphism of societies ills. The sacrificial death of Jesus is important because Christ is a guiltless figure, without sin. How is this conceptually different than, say, sacrificing a virgin to a hungry volcano? Human sacrifices in ancient cultures were often done to promote the growth of crops, the body of the victim being strewn out upon the fields. In Christian ceremonies it’s for the nourishment of the soul instead of the nourishment of the soil. It is the body of the savior that is consumed as food. This motif of the sacrifice of a life without flaw, a perfect specimen, can be seen in religious movements around the world, from the small sacrifice of a carefully selected animal without any blemish or flaw right on up to the ultimate sacrifice of a human being. A child would be a large sacrifice, but not as large as a grown human that had managed to mature without sinning. (The actual age of “person hood”, in which an individual is no longer viewed as property but is rather seen as a mature human being differs from culture to culture, but there is usually an initiation rite of some sort: a bar mitzvah, sweet sixteen party, etc). Sacrifice, the taking of an innocent life for the benefit of a society as a whole, was/is believed to transfer certain properties from the guiltless sacrificed party to the people, either the performers of the sacrifice, or the community at large. In the Book of Judges, Jephthah sacrifices his daughter after making a promise to Yahweh that he would sacrifice the first thing that walked through the door if he defeated the Ammonites. In the Iliad, Agamemnon sacrifices his daughter Iphigenia to win the favor of the goddess Artemis. In Genesis, the sacrifice of Isaac may have been thought of as an atoning act, though there is little indication that Isaac was a willing participant in the act. In the Jesus Passion, there is question as to Jesus’ ultimate knowledge of his own death; Mark’s version shows Jesus to be silent, and perhaps unwilling, Luke’s version portrays a much more involved martyr. In the all too familiar Isaac story, Abraham, who is not shown putting up much of a fuss when asked to slit his son’s throat, a practical joker of a God magically conjures up a sheep as a substitute for the boy in the nick of time (Just kidding there, big boy. You were going to do it, too!). The Greeks too had a variant of the myth in which it is Hercules that puts a stop to a human sacrifice, substituting a sheep instead. In a variant of Agamemnon’s sacrifice of his daughter, it was a deer that was substituted by the goddess at the last moment. In the ancient Greek culture, a human scapegoat, known as a pharmako, was chosen, usually a criminal. Records of the event differ, some claiming that the pharmako was sacrificed, with others taking it to be a mock ritual. Either way, the spirit of the event focused on a death that, through an unknown method, made up for the sins of the people. And this sacrificial death motif seemed to have taken the world of the 1st century by storm. Not only did Christianity arise at this time and place, but a slew of Mystery Religions worshiping the divine deaths of Mithras, Dionysus, Isis, Osiris, etc, swept across The Mediterranean region. This mystical replacement of the once all too common real world sacrifice could have been seen as a step in the right direction. Played out with responsibility it could have told the world that the slaughter of people or animals was no longer needed; that the ritual itself could unite the community. In all too many sects of Christianity, though, the death is fixated upon, made into a gruesome fetish that frees the believers from personal responsibility. The death of Jesus is compared to the death of the passover lamb in the gospel narrative, the lamb that was killed and who’s blood was painted on the doors of the Hebrews so that the angel of Death would pass over those houses, sparing the lives of their children inside (God, apparently, did not know your heart in those days, and needed a visual indicator on who to kill on who not to kill). In the Jesus variation of this Jewish myth, accepting the blood of Jesus protects us from divine judgment after death. This is why it is a matter of necessity to place the crucifixion during the passover festival. The Christian movement had split off from the Jews, no longer wanting to be slaves to Temple sacrifice of the priests, they accepted one of their own; a sacrifice that no longer needed to be tied to a physical location. When theology becomes nothing more than rationalization of mythology, it provides a disservice to both the philosophy that leads to it, for any philosophy no matter how sound is worthless when based upon a false premise, as well as the mythology, which, when crammed into a pseudo-historical setting, loses whatever edifying nature it may have once had. Crucifixion saves no one. There is no single saving event, only the struggles we face each day. The ancient Egyptian god Thoth is (mythically) known as the inventor of writing and author of the Book of the Dead. He is often shown in the process of writing. He is traditionally depicted with a humanoid body and the head of an Ibis, though he is sometimes depicted with the head of a baboon. Shine for us in the sky, every day. In the Roman era, Thoth was syncretized with Hermes when the ancient Greeks recognized their similar traits and believed them to be different incarnations of the same god. This new character was known as Hermes Trismegistus, the mythical founder of Hermeticism. Hermeticism was seen as a mystical pantheistic philosophy that could be practiced in conjunction with other religions as the finding of Hermetic writings along side Gnostic Christian works in the ancient Nag Hammadi library shows. The earliest Christian documents that we have portray the death of Jesus as a mystical experience, not tying it to any historical place or time. It was only once someone made the effort to turn the belief into a narrative with the Gospel According to Mark, 50 years to 100 years after the supposed event, that the death trial of Jesus was extrapolated into the passion play that we know today. And it was then portrayed differently in each of the following attempts to re-tell the tale to different audiences. In the earliest gospel, Mark, Jesus is lead silently to his death. He is mocked along the way and, as he dies, he cries out “My God, my God, why hast thou forsaken me?” At the turn of the first century, this portrayal of a truly gruesome death would have been the story converts of Christianity would have had preached to them. Evidently, a kindler gentler death was soon needed, for the popular re-write by Luke has Jesus going to his death practically cheerful, preaching to the women along the route and picking up a new Christian convert on the cross next to him before he cries Mission Accomplished. The earliest copies of Mark that we have end when the women go to the tomb and find it empty. The women flee in terror and tell no one. Mathew added an earthly re-appearance by Jesus (the re-animation of the saints in Mathew 27: 51-53 shows us that an earthy re-birth from the tomb was an important element to his movement). Luke adds an ascension to heaven, mostly like intended to be a reference to the ascension of Ilijah, an earlier savior figure in the Old Testament. The story of the crucifixion began simply, plain, and deeply mythological by a charismatic offshoot of Judaism in the first century CE.. The story grew over that years, and that is what we continue to see today. Theologians look for a spiritual message of divine acceptance and love in what began as little more an idea. Modern Christians, only familiar with fleshed out movie dramatizations of the narrative cannot imagine how the story could have been “invented” or “made up” so they demand evidence that it didn’t happen. Well, the evidence is usually sitting on a book shelf, gathering dust; it’s all in a book they love so much they dare not read it critically.